* = will participate in speed date. Read bios carefully to find the best fit for your work! * Jordy Albert is a Literary Agent and co-founder of The Booker Albert Literary Agency. She holds a B.A. in English from Pennsylvania State University, and a M.A. from Millersville University of Pennsylvania. She has worked with Marisa Corvisiero during her time at the L. Perkins Agency and the Corvisiero Literary Agency. Jordy also works as a freelance editor/PR Director. She enjoys studying languages (French/Japanese), spends time teaching herself how to knit, is a HUGE fan of Doctor Who, and loves dogs. She is looking for stories that capture her attention and keep her turning the page. She is looking for a strong voice, and stories that have the ability to surprise her. She loves intelligent characters with a great sense of humor. She would love to see fresh, well-developed plots featuring travel, competitions/tournaments, or time travel. Jordy is specifically looking for: Middle Grade: contemporary, fantasy, action/adventure, or historical; YA: sci-fi, dystopian/post-apocalyptic, contemporary, historical (though she is open to looking at other sub-genres, she’s looking for YA that has a very strong romantic element); NEW ADULT CONTEMPORARY ROMANCE; Romance (contemporary and historical). much more. Among Sheree’s nonfiction clients are Jane Eldershaw, Bill Walsh, Margo Perin, Albert Ellis, John Carpenter (first millionaire on “Who Wants To Be A Millionaire?”), Bill Baker (President of Channel 13, PBS in NYC), Supermodel Roshumba, and Richard Roeper (of Ebert and Roeper). In the area of fiction, Sheree’s clients include Donna Anders and Leslie Rule. Sheree is an Adjunct Assistant Professor of Publishing at New York University and teaches at SEAK’s conferences for doctors and lawyers. Sheree is very proud to represent her latest author, Philadelphia Stories‘ essay editor Julia MacDonnell, author of MIMI MALLOY AT LAST (Picador), whom she met at Push to Publish! *Jody Klein is an agent at Brandt and Hochman Literary Agency. She is actively acquiring literary and upmarket fiction—novels that lean a bit more literary, while still containing a strong commercial hook. This also includes historical fiction, family saga, sophisticated crime/suspense, magical realism, graphic novels and memoirs, as well as narrative nonfiction (especially related to sports, pop culture, science or history). Jody is drawn to page-turning, character-driven stories with real emotional pull. Jody is also the Administrative Secretary of the Association of Authors’ Representatives. *Gina Panettieri is President of Talcott Notch Literary Services, a 5-member boutique agency representing a full range of fiction and nonfiction for adults and children. A 25-year veteran of the publishing industry, she’s placed hundreds of books with publishers such as Berkley, McGraw-Hill, Wiley, Macmillan, and Adams Media. Currently, she’s seeking edgy, darker Young Adult and adventurous or humorous Middle-Grade fiction, as well as all genres of adult fiction, and in nonfiction will consider business/career/investing, cookbooks, crafts, self-help, memoir, travel, popular science, history, true crime and gift books. She is also always on the hunt for projects for her agency colleagues, and has brought home a number of projects from conferences and contests that have been signed and sold that way. *Kate Johnson is a literary agent and vice president of Georges Borchardt, Inc., where she has worked for eight years. She previously edited and reported at StoryQuarterly, Bookslut.com, New York magazine and elsewhere, and graduated from Northwestern University’s Medill School of Journalism. She loves working with journalists, but is also on the hunt for literary fiction, memoir and narrative nonfiction. *Rita Rosenkranz founded Rita Rosenkranz Literary Agency in 1990 after a career as an editor with major New York houses. She represents health, history, parenting, music, how-to, popular science, business, biography, sports, popular reference, cooking, writing, spirituality, and general interest titles. Rita works with major publishing houses, as well as regional publishers that handle niche markets. She looks for projects that present familiar subjects freshly or lesser-known subjects presented commercially. *Eliza Rothstein is a literary agent at InkWell Management. Her interests include literary and commercial fiction, narrative non-fiction, memoir, popular science, and food writing. Eliza studied Comparative Literature and Art History at the University of Pennsylvania, and is a graduate of the Columbia Publishing Course. She previously worked at The Susan Golomb Literary Agency, and is also a founding member of City Readers, a nonprofit organization committed to providing books for public and charter schools in New York City. Rebecca Albani, Publisher Relations Manager at Bowker, has been working in the publishing industry for the past 8 years. She has worked on both the book publishing side as well as the metadata side of publishing. She currently assists publishers, both large and small, with making their data more discoverable to customers and therefore helping them increase their sales. Rebecca educates publishers on the types of metadata that should be supplied with their titles and the most effective method of submitting this data to improve search ability. On behalf of Bowker, she continues to speak on enhancing bibliographic data to both self-publishers as well as traditional publishers. *Courtney K. Bambrick is the poetry editor at Philadelphia Stories. Her poetry has appeared or is forthcoming in such journals as Apiary, Certain Circuits, Dirty Napkin, Philadelphia Poets, and the Schuylkill Valley Journal. Courtney currently teaches writing and literature at Holy Family University, Philadelphia University, and Gwynedd-Mercy College. She recently coordinated the third annual Children’s Arts Program for kids at Old Academy Players in her neighborhood. She lives with poet Peter Baroth in East Falls. For speed date: poetry. Cordelia Frances Biddle is a critically acclaimed novelist with a passion for history. Her Martha Beale series is set in Philadelphia during the 1840s: Without Fear, Deception’s Daughter, The Conjurer. According to The Philadelphia Inquirer: “Biddle successfully uses 19th-century Philadelphia, mining the landscape for the kinds of jewels that illuminate a good mystery, and shaping characters that ring true to the elements of their creation.” The books were inspired by research into the lives of her Biddle and Drexel ancestors. Cordelia has recently completed another novel set in Victorian-era Philadelphia, and a biography of Saint Katharine Drexel. She teaches creative writing at Drexel University’s Honors College, and received the Outstanding Teaching Award in 2012. *Rosemary Cappello edits and publishes Philadelphia Poets, which she founded in 1980, and in conjunction with that publication, organizes and presents poetry readings throughout each year and bestows two annual awards. Her poetry has appeared in a number of publications, including Anthology of Women Writing, Voices in Italian Americana, Poet Lore, Avanti Popolo, and Iconoclast. Her chapbooks include In the Gazebo, The Sid Poems, and San Paride. She is a published prose writer as well, mainly of essays and film reviews. For speed date: poetry. * Grant Clauser (Schuylkill Valley Journal) is the author of the book The Trouble with Rivers. 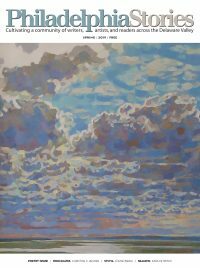 Poems have appeared in The Literary Review, Painted Bride Quarterly, Cortland Review, Sow’s Ear Poetry Review, Philadelphia Stories and others. In 2010 he was Montgomery County Poet Laureate. His interviews with other poets have appeared in the Schuylkill Valley Journal and The American Poetry Review. He has been a submissions reader and editor at various journals including The Mid-American Review, Toad Highway Poetry Review and Janus. He conducts workshops at writing conferences and at Philadelphia’s Musehouse and runs the blog www.unIambic.com. For speed date: poetry. * Kara Cochran is the poetry editor of the Rathalla Review. *Cathy T. Colborn is the creator of Philly Flash Inferno, an online (and soon to be print) journal, featuring flash, poetry, interviews, and artwork with the ongoing theme of The Seven Deadly Sins. Visit her websites: Phillyflashinferno.com and http://cathytcolborn.blogspot.com. For speed date: flash fiction. Eileen M. D’Angelo is the Editor of Mad Poets Review, two-time finalist of the Allen Ginsberg Awards given by the Paterson Literary Review, and President of Philadelphia Writers Conference Board of Directors. She was nominated for a Pennsylvania Governors Award in the Arts, judged open auditions in Philadelphia for the pilot program of HBOs Def Poetry Jam, and has book reviews and poetry published in Rattle, Manhattan Poetry Review, Drexel Online Journal, Paterson Literary Review, Wild River Review, The Independent Review, Lilipoh, Philadelphia Poets, One Trick Pony, Odessa Poetry Review, The Aurealean, Bookends, HiNgE, Philadelphia Stories, and others. Director of the Mad Poets since 1987, she has coordinated over a thousand readings and special events, for poets and students, throughout the Delaware Valley. *Kathleen Volk Miller is co-editor of Painted Bride Quarterly, co-director of the Drexel Publishing Group, and an Associate Teaching Professor at Drexel University. She is a weekly blogger (Thursdays) for Philadelphia Magazine’s Philly Post. Volk Miller writes fiction and essays, with work in publications such as Salon.com, Opium, thesmartset.org, the New York Times Motherlode and with upcoming work in Drunken Boat. She is currently working on My Gratitude, a collection of essays. Recently, Kathleen Volk Miller was named a Creative Connector by Leadership Philadelphia. For speed date: fiction. Lise Funderburg’s latest book, Pig Candy: Taking My Father South, Taking My Father Home, is a contemplation of life, death, and barbecue, and it was chosen by Drexel University for its 2012 Freshman Summer Read. Lise’s articles, essays, and reviews have been published in The New York Times, TIME, The Philadelphia Inquirer, The Nation, MORE, Chattahoochee Review, the Oprah Magazine, and Prevention. She teaches creative nonfiction at The University of Pennsylvania, Rutgers, and the Paris American Academy. Thomas V Hartman is a writer, photographer/videographer and new media producer. His publishing experience spans 15 years and includes senior editorial roles with Elsevier and John Wiley and Sons. In addition, Hartmann has developed Websites and other digital content for clients such as Harcourt College Publishers, Pearson/Prentice Hall, and Rutgers University; Hartmann is a former columnist for Pif magazine and a Senior Editor/Web Editor at Painted Bride Quarterly. He has contributed to the Philadelphia Inquirer, The Photo Review, and other publications. His photography has appeared recently in Stated magazine, where he is a contributing editor, and in N + 1. Hartmann is a graduate of the University of Pennsylvania and Columbia University, and he is a former Writing Center Associates Fellow at Georgetown University. Don Lafferty’s short fiction has appeared in NEEDLE MAGAZINE, CRIME FACTORY MAGAZINE, SHOTGUN HONEY and a number of other markets and anthologies. He’s written corporate communication, marketing and advertising copy, and feature magazine articles. Don is a regular contributor to the global conversation about marketing through the social media channel, and blogs at www.donaldlafferty.com. Don is a regular speaker, teacher and the Chief Marketing Officer of the digital marketing agency, Mingl Social. He’s a member of the Philly Liars Club, the social media director of the Wild River Review, and serves on the board of directors of the Philadelphia Writers’ Conference. Cick here to read our interview with Don. Tracey M. Lewis-Giggetts is currently an adjunct professor in the graduate publishing program at Rosemont College, as well as, a writing instructor at Philadelphia University. Tracey is also the Managing Editor at CLC Publications, a 72-year old publisher of religious non-fiction based in Fort Washington, PA. As a writer, she is the author of six books including her latest novel, The Unlikely Remnant, and her nonfiction book, The Integrated Church: Strategies for Multicultural Ministry (Beacon Hill). Tracey’s writing has been published in local, regional, and national publications (online and print) such as Philadelphia Weekly and Heart and Soul Magazine. Jon McGoran is the author of Drift, an ecological thriller released in July 2013 from Tor/Forge Books. Writing as D. H. Dublin, he is the author of the forensic crime thrillers Freezer Burn, Blood Poison, and Body Trace, from Penguin Books. His short fiction, nonfiction and satire have appeared in a variety of publications and anthologies. He is a member of the Mystery Writers Association, the International Association of Crime Writers, and the International Thriller Writers, and a founding member of the Liars Club. He is the editor in chief of Grid, a magazine covering issues of sustainability. For many years, he was Communications Director at Weavers Way Co-op, and editor and publisher of the monthly newspaper, The Shuttle. * Diane O’Connell is the editorial director at Write to Sell Your Book, based in New York City. A former Random House editor and author of five books, Diane specializes in helping first-time writers become published authors. Her clients have garnered six-figure advances, gone on to become bestselling authors, and been featured in major media markets, such as 20/20, Oprah, Psychology Today, PBS, and TED Talks. For speed date: fiction, non-fiction. about women writers writing while being mothers. For more information about Kathye Fetsko Petrie including links to some of her published writing go to www.kathyefetskopetrie.com. Miral Sattar is founder and CEO of BiblioCrunch, an author services marketplace that connects authors with quality, vetted book publishing professionals. She has worked in the media industry for 11 years, most recently at TIME. Her writing has been featured in PBS, TIME, CNN, NY Daily News, among other media publications. She has a MS in Publishing (Digital + Print Media) from NYU and a BS from Columbia University in Electrical Engineering and Computer Science. You can follow Miral on Twitter at @BiblioCrunch. Debra Leigh Scott is the author of a collection of short stories, Other Likely Stories, (Sowilo Press), a work of inter-related stories set in the tumultuous 1960s. Her next work of fiction, Piety Street, (forthcoming, New Door Books) is the first novel of a trilogy. As Founding Director of Hidden River Arts, Debra has grown this inter-disciplinary arts organization for nearly ten years. It now includes gallery events, an independent small press, yearly fiction and drama competitions, outreach events, music, performance, literary readings, workshops and classes. Karen Pokras Toz writes middle grade and adult contemporary fiction. Her books have won several awards including the Readers’ Favorite Book Awards, First Place in the Children’s Chapter Books category and the Grand Prize overall in the 2012 Purple Dragonfly Book Awards, as well as placing first for a Global E-Book Award for Pre-Teen Literature. A native of Connecticut, Karen now lives outside of Philadelphia with her husband and three children. For more information, please visit www.karentoz.com. *Nancy Viau is the author of LOOK WHAT I CAN DO! (Picture Book/Abrams Books for Young Readers, 2013), STORM SONG (Picture Book/Two Lions, 2013), CITY STREET BEAT (Picture Book, Albert Whitman & Co., 2014), and SAMANTHA HANSEN HAS ROCKS IN HER HEAD (Middle-Grade/Abrams/Amulet Books, 2008). Her stories, poems, and activities appear in Highlights, Highlights High Five, Ladybug, Babybug, and many other magazines. She is a member of The Authors Guild, the Society of Children’s Book Writers and Illustrators, and The KidLit Authors Club—a regional marketing group she started that consists of authors who bring interactive book parties to bookstores, libraries, festivals, and conferences. www.NancyViau.com. For speed date: Children’s/Middle Grade/YA. *Jesse Waters is the Director of the Bowers Writers House at Elizabethtown College, and runner-up for the Iowa Review Prize in Fiction and the Atlanta Review International Poetry Prize, Jesse Waters’ poems, short stories and essays have appeared in magazines such as Adirondack Review, Magma, Story Quarterly, Sycamore Review, Southeast Review and The Cortland Review. His first book of poems, Human Resources, was released by Inkbrush Press in March of 2011. For speed date: fiction, nonfiction, poetry. Jerry Waxler teaches nonfiction writing at Northampton Community College, and is the author of the blog, Memory Writers Network, which contains hundreds of essays, book reviews, stories, and writing prompts about reading and writing memoirs. Mr. Waxler is the author of three nonfiction books, most recently Memoir Revolution, is a director of the Philadelphia Writers Conference, and has taught and spoken about memoir writing at many regional and online writing groups. He has a Master’s Degree in Counseling Psychology.